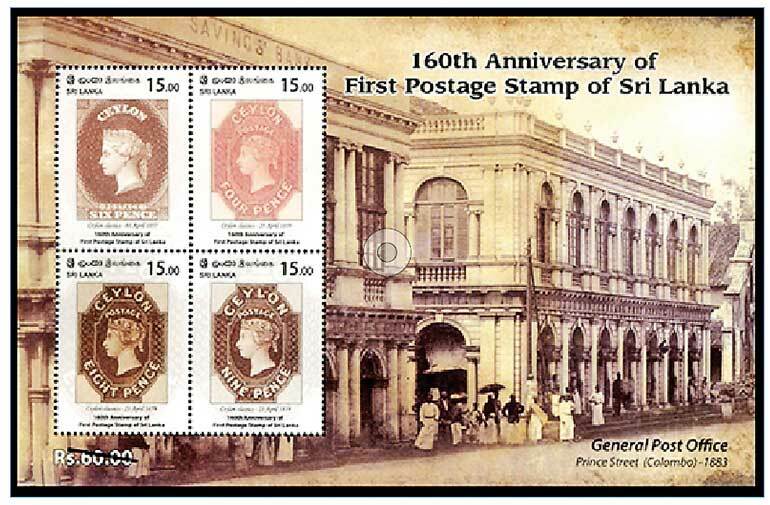 The earliest stamps used when Sri Lanka (then Ceylon) was a Crown Colony in the British Empire are rare. Four stamps depicting these were released early this month (1 April) to mark the 160th anniversary of the release of the first postage stamp in the country. It was 27 years after Britain scored a ‘first’ becoming the first country in the world to introduce adhesive postage stamps that Ceylon started using stamps. 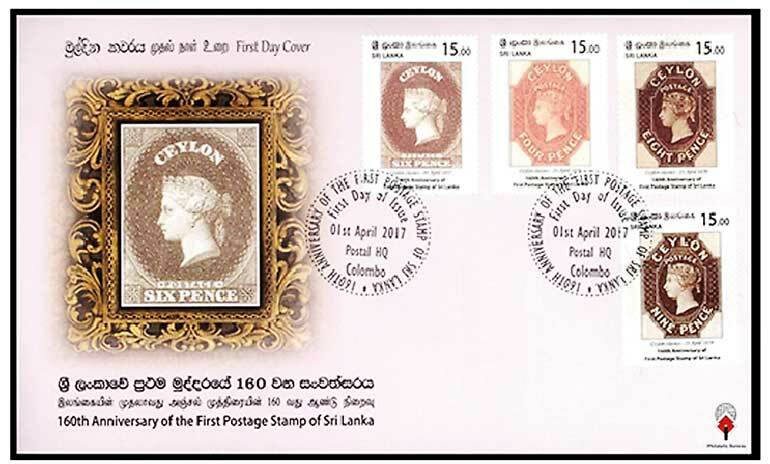 It is reported in the Crown Agents Stamp Bulletin that a so-called ‘Free Post’ was in operation in Colombo by 1809 for the benefit of British troops in Ceylon. By 1822 a post office had been established in Colombo and by 1846 there was a daily mail coach service linking the capital with the towns of Kandy and Galle. The first step to issue postage stamps was taken in 1854 by the acting Postmaster-General, G.G. Frazer, who ordered 60,000 copies of a new purple coloured 6d stamp released in the UK depicting the embossed head of Queen Victoria. Another order was placed for the stamp to be overprinted with the word ‘Ceylon’ to identify the country of issue. The printers Perkins Bacon & Co Ltd. (UK) – the same company had printed the wold’s first postage stamp – printed a new stamp of 6d denomination and a stock of 60,000 stamps was received in December 1855. However, it was not until 1857 that the stamp was released to the public. The first adhesive stamp was issued on 1 April 1857 in the value of 6d to pre-pay the first letter rate to England by ship for half-ounce letters. This was recess-printed on blue paper with a star watermark and without perforations which meant that the stamps had to be cut from a sheet and sold to the public. There were 250 stamps in one sheet. The perforated stamps were issued in 1861. The perforations were reported to have varied greatly in consistency and quality. Stamps of other denominations appeared at regular intervals. Four stamps – 5d chestnut, 6d brown, 10d orange-vermillion and 1sh dull violet – were issued on 2 July 1857. These were printed by the same firm on white ‘star’ watermarked paper. Two more stamps – 1d blue and 2d green – followed. Half ounce being the internal postal rate for printed matter (newspapers and the like), a ½d lilac was issued in October 1857. All these stamps carried the portrait of Queen Victoria. The Crown Agents Bulletin stated that it was interesting to note that the background of many of these stamps was that previously used for the first issues of Chile, while the unusual portrait of Queen Victoria was simultaneously used for the stamps of the Ionian Islands then under British occupation. Four stamps in the values of 4d, 8d, 9d, 1sh9d released on 23 April 1859 had a different design – one with an embodied octagonal frame. The 4d dull rose stamp in this category has been accepted as the rarest and the most highly-priced Ceylon stamp. A few years ago, the price quoted for an unused copy was £50,000. With the adoption of decimal currency in 1872 – 100 cents to the rupee – new definitive series was issued in the denominations of Cents 2, 4, 8, 16, 24, 32, 36, 48, 64 and 96 in small format and Rs. 2.50 in a large format. All depicted the head of Queen Victoria. The first cent denominations were direct conversions of pence into cents. A penny was calculated as four cents. Two shillings were equal to one rupee. The stamp denominations were thus directly linked to the conversion from pence and shillings to cents and rupees. For some time, the decimal currency was tied to the old penny rates of postage.